In 2000 the FIA commissioned a research programme and a series of reports (Winning the Retention Battle) designed to provide an industry definition of retention and an industry benchmark. Whilst the reports were warmly received, individual clubs and operators have, for a variety of reasons, been unable to compare their performance with others in the industry using the new model. Melvyn Hillsdon reports. At present, most UK clubs use the following formula to calculate attrition: the number of membership cancellations per month divided by the number of sales per month. For example, if 20 members cancelled in a month and 100 joined, the attrition rate would be 20%. The 12-month attrition rate is calculated by averaging these rates over a year. If two clubs report the same attrition rate it would seem reasonable to assume that they were performing equally. But, because the existing model provides no information on the length of each individual‟s membership, it is entirely possible for two clubs to have identical 12-month attrition rates and perform very differently (because the average length of stay differs). Similarly, using the existing method, an 80% retention rate does NOT mean that 80% of the members stay at least 12 months. It simply shows that in a 12-month period there were 20% more sales than there were members who quit. In the US, annual attrition is calculated by dividing the total cancellations in a 12-month period by the average number of „live‟ members in the same 12-month period. Although it is referred to as an annual attrition rate it does not mean for example that 50% of members quit within a year. It simply means that the number of members who quit within a 12-month period, expressed as a percentage of the average number of „live‟ members in the same period, is 50%. Beyond telling the sales team each month how many new members they need to get to replace the ones who have dropped out, both these methods of calculating attrition have limitations in terms of managing the retention and business side of a club. This approach to measurement is used in the health sector for calculating time between events. For instance, waiting times, time until a complication occurs, or survival time following treatment. This powerful tool can be used for measuring any time-to-event where there is a start date, an event date (such as cancellation date), a follow-up date and a measure of whether the event (like a membership cancellation) has occurred or not. improved. Even if the proportion of people surviving at 52 weeks is the same (as in the example), it still means that more members are staying for longer before cancelling and therefore paying more in monthly dues. It is the area under the curve that is a driver of club revenues, and it is the area under the curve which clubs should aim to maximise. For companies with more than one club, a plot can be made for each club allowing for between club comparisons. This measure is sometimes referred to as the "churn rate‟. The churn rate gives an indication of the turnover of members. It can help guide sales teams, as it tells you how many members per thousand are being lost each month and therefore how many need replacing in order to maintain the membership base. It can also be used to benchmark clubs against each other, to enable learning and improvement to take place. Compare the clubs in Figure 2. Assuming they all started the year with 1,000 members, Club C needs to recruit at a rate of 46 new members a month to maintain its 1,000 base compared to Club B which only needs to recruit 37. This also shows how closely linked sales and attrition are. The final measure of retention is the average length of membership or the life span of a membership. 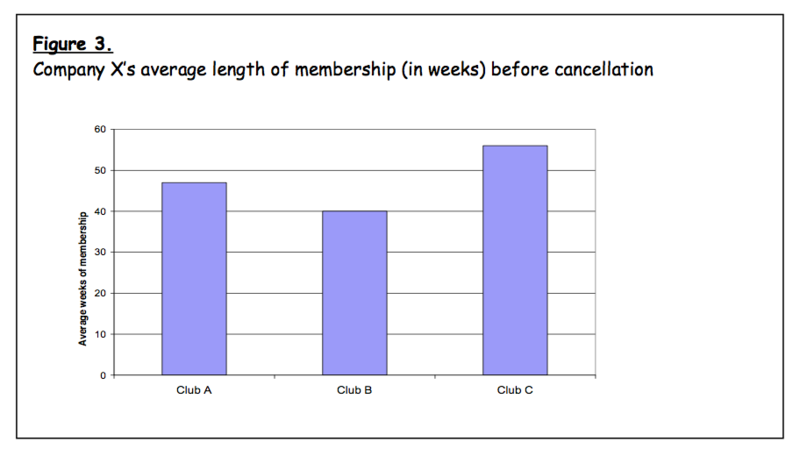 This is calculated using the data from survival analysis and it represents the average length of membership before a member cancels. The „average‟ reported is actually the median value – the exact middle value of the range of membership durations. 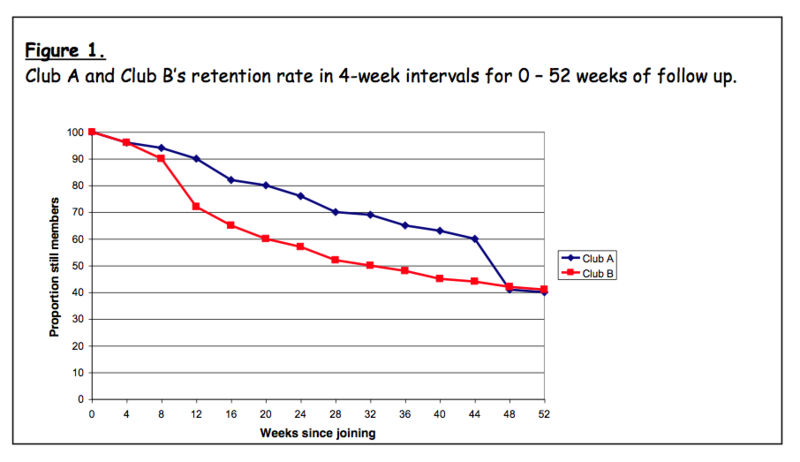 So for example, if the median membership duration was 48 weeks, then half the members stay less than this and half stay longer. This is a particularly useful measure as it can be used to help calculate an average income per member from membership dues, thus allowing revenue projections to be made. It can also be used to measure changes in retention. Imagine, for instance, how much extra income would be received if all new members paid an extra month before leaving.